With the EK1000, Beckhoff has expanded the EtherCAT I/O system with a new bus coupler. The device enables the communication of EtherCAT segments with remote EtherCAT controllers via heterogeneous Ethernet networks. Through support of TSN (Time-Sensitive Networking) functions, the coupler enables delays caused by switches in Ethernet networks to be minimised and the wide range of EtherCAT I/O terminals and other EtherCAT devices to be used in TSN network environments. The EtherCAT TSN Coupler combines the advantages of the EtherCAT world with those of TSN networks. 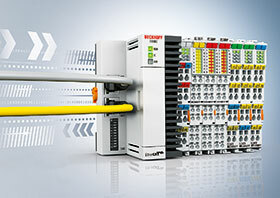 EtherCAT is ideally suited to combine the numerous small data packets of digital and analog inputs, which typically occur in industrial environments, into a complete process image. TSN on the other hand, enables the definition of data streams in heterogeneous Ethernet networks for a real-time capable, prioritised transmission of such data streams across the network infrastructure. As a result, control systems can address multiple EtherCAT segments in real time via TSN across Ethernet networks. To this end, no modifications are required in the EtherCAT slave devices. The EtherCAT TSN Coupler, placed as the first device within an EtherCAT segment, provides two Ethernet interfaces. One of these 100 Mbit/s ports connects the coupler with the Ethernet or TSN network. The second port can be used for optional integration of additional remote EtherCAT devices. The EK1000 ensures the transfer of telegrams from the TSN to the EtherCAT port with minimised delay. In this way, proven EtherCAT features such as distributed clocks and eXtreme Fast Control (XFC) or communication with EtherCAT-enabled drives are now also available within TSN networks. In networks without TSN extension, the bus coupler can also be used for integrating an EtherCAT network with a standard Ethernet network.